Kingston Wall is a Finnish power trio who seem to operate outside the normal "progressive rock" distributors, yet would certainly be a crossover group of great potential. While the band has been around for quite some time, they have only recently come to the attention of the general prog-rock audience. The group is a trio of exceptional talent led by guitarist / vocalist Petri Walli. Walli's guitar playing and ideas seem to be a cross between psychedelic rock from the 60s and 70s and a modern rock somewhat in the Seattle / grunge area without being musically banal (well not too often anyway). Walli is backed by the thunderous rhythm section of bassist Jukka Jylli and drummer Sami Kuopamakki who are talented enough to never let the music verge one dimensional. They make quite a sound for a trio yet are often augmented by synths and even didgeridoo at times. The band wouldn't have made much of a fuss with their debut. 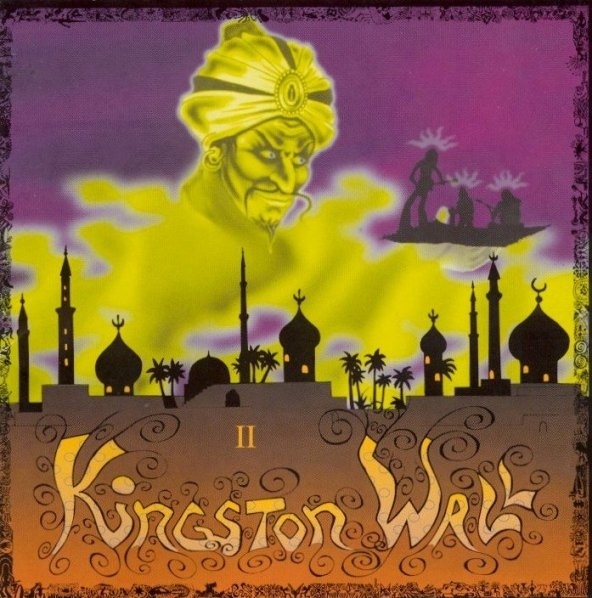 Kingston Wall is more or less a collection of hard rock songs. I hear Hendrix, Led Zeppelin, Black Sabbath, and some of the NWOBHM stuff like Iron Maiden, Ozzy etc. ; on to more modern influences – Faith No More, Jane's Addiction, and as said before a little grunge. It's obvious Walli's guitar playing was heavily influenced by Hendrix and Jimmy Page; there's even an energetic cover of "Fire" here. It's not until the long 21 minute "Mushrooms" that you begin to hear the future of this group – the hints towards psychedelics and more unusual ethnic elements. Kingston Wall's second was a much more inventive affair. The band's music is certainly more expressive here, with Walli's guitar playing exploring more exotic and eastern scales similar in ways to Ozric Tentacles. There are a lot of brilliant instrumentals ("Istwan" to name one) that remind me of early Black Sun Ensemble or a fuller Tangle Edge. The sound seems to have taken on a more ethnic bent, and there are a lot of psychedelic and new age references as well. While there are a few duff tracks – basically dull rock songs with annoying vocals – most of this is fantastic music, well worthy of the attention of Ozric and Hendrix fans. Kingston Wall III "Tri-Logy" is much the same, but some of their obvious excesses seem blown out of proportion here. Lyrically, the band doesn't cut it all – the opener "Another Piece of Cake" is a good indication that their grasp of English is so poor its embarrassing (really we don't mind if you sing in Finnish!). Unfortunately so is their conceptualizing; obviously some sort of new age / holistic / mythology type of idea, the overall effect is that there were far too many psychedelic drugs in the studio. With the over the top packaging (but you gotta love the cover) it almost seems like no substance and lotsa frills. However the music (when the lyrics aren't crowding them out) is quite good and much more spacious than their previous releases. With heavier synth use and some more Middle Eastern ethnic themes, the overall effect is still quite impressive, and definitely recommended to fans of a neo-psych sound. With rumors that the band has broken up, it's hard to say what's next but certainly Kingston Wall has made its mark. A band whose career was tragically cut short by the death of leader, vocalist, and guitarist Petri Walli, Kingston Wall had at least a couple of faces. Live the band was something of a classic rock group with a really strong influence from Jimi Hendrix, and could jam for ages. On album, the face introduced to us mostly outside of Finland, Kingston Wall came off more like a space rock group, almost as if they were in the lineage of Ozric Tentacles, something that arose due to a lot of synth use and multitracking. This was the first of their three studio albums I heard and it was a revelation. For a trio they were very strong at all positions, and the drumming was always in front and very muscular, giving the band's music a very strong drive. The songwriting (mostly their own) was quite memorable ("Love Tonight," "Two of a Kind," and "Shine on Me" all immediately come to mind with their great hooks) but it never got in the way of allowing Walli to Hendrix out on just about everything. But probably my favorite moment on the whole album (not to mention another contender for the favorite song list) is the Eastern-tinged, acoustic-guitar driven instrumental "Istwan." They'd move in an even more noticeably psychedelic direction for their third and last, but II was their most balanced album, the one that showed all of the band strengths and few of their weaknesses (they could be very unfocused live). It was a highlight of the early 90s.